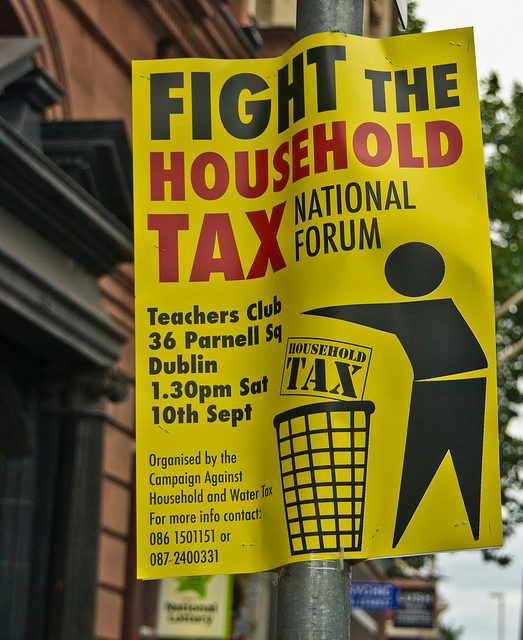 Tension around the household tax is rising in Dublin 8. The government has instructed councils to send warning letters to hundreds of thousands of non-payers. Only 700,000 people have registered, with over 52% boycotting. Based on figures from the 2011 census, 1.45 million families were due to register their 1.8 million houses. But what are the potential punishments for not registering? There are no automatic fines and you cannot be jailed for refusing to pay. While non-registration is an offence, it is not the type of conviction which will inhibit travel or visas. That said, if you’re taken to court and found guilty, the judge has the power to slap on a €2,500 fine, the maximum Class C fine. This, by law, can’t be taken from your income or social welfare. Just to note, the ‘Campaign against household and water taxes’(CAHWT) says this enforcement letter you’re getting in the post is not a summons. Given packed court schedules, only a small minority can be taken in, so this is just a caution. According to the government, the EU/IMF Programme of Financial Support for Ireland directs them to introduce a property tax for 2012. According to Householdcharge.ie, Ireland is one of the last countries in Europe not levy property-based charges in order to pay for local services. These services include fire and emergency services; maintenance and cleaning of the streets; planning and development; public parks; street lighting; libraries; open spaces and leisure amenities. Basing their mailing lists on the Property Registration Authority of Ireland and the Private Residential Tenancies Board, warning letters have been sent out to family members dead as long as 20 years. Cllr Thomas Gould (SF) described the letters as “bullyboy tactics”. His father received one of the warning letters addressed to his wife who has been dead since 1993.
Letters were also sent out to those who had already coughed up the tax. Cllr Declan Hurley (Ind) said he got two bills and he’d paid. “One of my staff got a bill in her maiden name and she’s nearly 30 years married”, he added. Not only are people getting letters of warning, but these are often deeply upsetting and wasting tax payer’s mulah for no purpose. It begs the thought at the hundreds of euro emptied down the drain in its reckless spending. Should we pay another €100 in tax to pay for the state’s mistakes?